Earlier this month, we announced all of our 2015 College Scholarship recipients. There were so many amazing applicants with inspiring stories and goals, and like every year, our scholarship committee had a really hard time narrowing down to the final 7 winners. We are honored to be able to help students achieve their dreams. Throughout the next few months, we will be featuring each individual winner on our blog, so stay in the loop and sign up for our newsletter to get notified when new posts are published. This week, we are happy to feature one of the recipients this year, Mallory Turner. Mallory, a 22-year old student attending graduate school in Accounting, is an amazing person who proves a great dedication to her goals and achieving academic excellence. 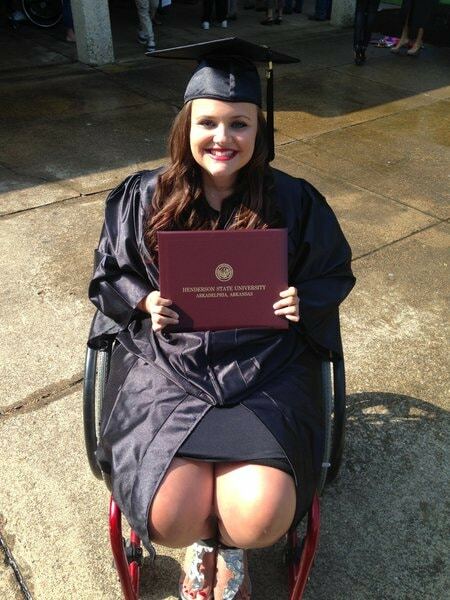 When she was only 16, she was injured in a car accident that left her quadriplegic. “To an independent, athletic, and outgoing 16-year-old girl, it seemed like the end of the world,” Mallory said, recalling the aftermath of the accident when she was told she would be in a wheelchair the rest of her life. Despite the odds, she was determined to not let this new condition and way of life derail her dreams. Mallory wrote in her essay: “I wanted an even playing field; that way when I do succeed, it is on my own merit and not because I received preferential treatment.” With a little ingenuity, she has learned to type using only her pinkies and utilizes various ways to make tools such as pens or makeup brushes easier to handle. She graduated at the top of her class in high school, maintaining a 4.03 GPA. Although college was an entirely new challenge, she made it through all four years, and as of this fall, she is pursuing a Master of Business Administration. She is on the HSU Honor Roll and is an active member of Gamma Beta Phi Honor Society, Phi Beta Lambda Collegiate FBLA, and Psi Chi International Honor Society. She also enjoys assisting her church by functioning as the AWANA bookkeeper and the co-ed softball coach during the summers. Mallory’s commitment to her goals and her independence is really incredible, and we are happy to be able to contribute a piece toward her future. 180 Medical is honored to offer an annual scholarship program to help those with spinal cord injuries, spina bifida, transverse myelitis, ostomies (ileostomy, urostomy, and/or colostomy), and/or neurogenic bladder. We know paying for college isn’t easy these days, and we understand there can often be extra financial difficulties for aspiring students who live with these conditions. To learn more about 180 Medical’s College Scholarship, visit www.180medical.com/scholarships. Meet one of our 2015 Scholarship recipients and learn more about what she plans to achieve.